SPAR South Africa endured a 16-hour transit from Switzerland to the Czech Republic for the second part of their European Tour. The trip, which was hastily changed due to an avalanche, saw the team take five busses and two trains on their trip to Prague. 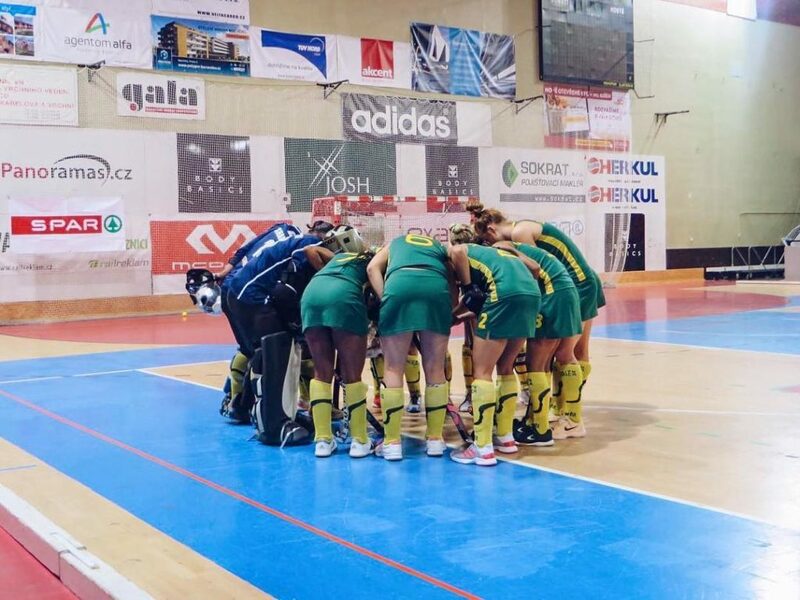 Having arrived in the morning on Monday, they faced the fifth ranked Czech Republic in the first of four test matches in Prague. The opening test was started with Kelly Reed receiving her 50th cap, joining both Jess O’Connor and Cindy Hack in the 50-cap club. It’s a testament to the work done by Lennie Botha and the superb sponsorship by SPAR that the indoor hockey ladies have had a world class program developed for them. The hosts were the favourites and lived up to that billing in the first half opening a two-goal lead through Lucie Duchkova and Natalie Hajkova. They extended the lead in the second half when Nikol Babicka made it 3-0. The SPAR South African ladies were quite tired but created good chances themselves with Cindy Hack hitting the post twice and Tegan Fourie missing the kind of chance she buries regularly. They did get the consolation goal for the visitors through the impressive Jess Lardant who finished from a fantastic flick at penalty corner time. So, with 1 game down in the series, the South Africans will look to rest well and return to the action with two tests on Tuesday. They would love to secure a victory that would ultimately be the ultimate feather in the cap of a superb tour! We will be keeping you updated right here!